First revealed in May, Apple's beta iCloud testing ground has been putting the finishing touches on new Notes and Reminders apps. The new apps are virtually identical to their iOS and OS X Mountain Lion siblings. 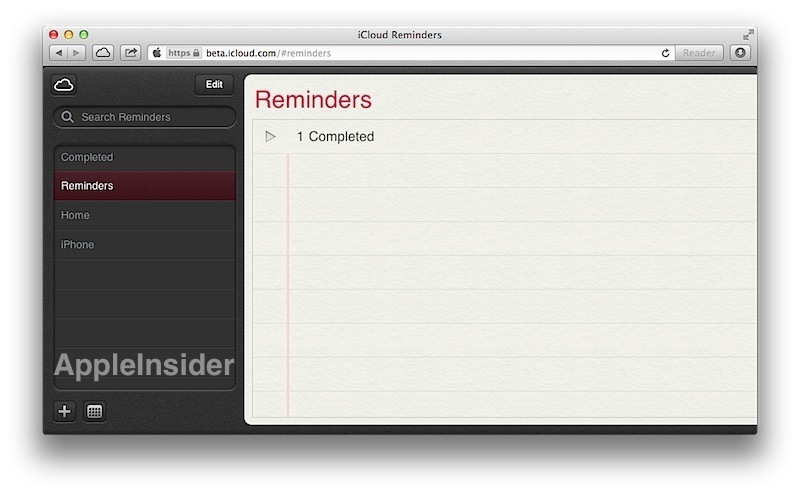 The new Reminders web app (shown below) offers a cloud-based version of events synced with iOS mobile devices and desktop Macs, although it does not support location based reminders (simply ignoring any "geofence" reminder settings triggered to go out when entering or leaving a particular location). 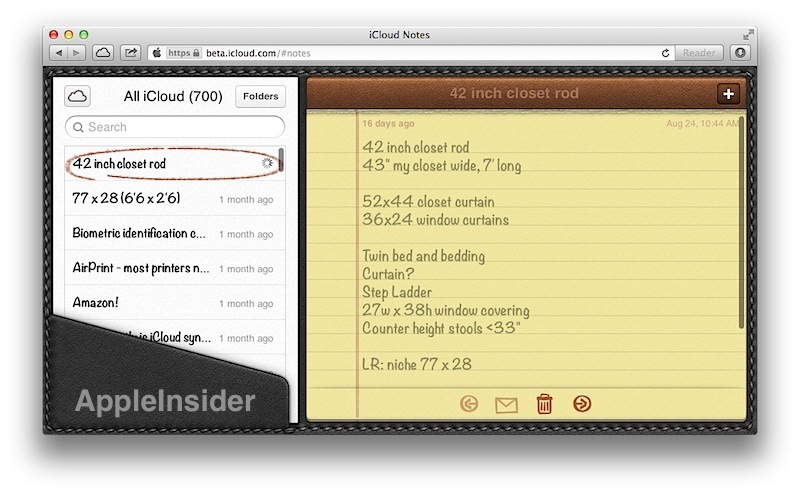 Notes gets a similar web treatment (below), although unlike its iOS and OS X counterparts, there's no way to change the default font from Noteworthy. Notes on the web also reflects the stitched leather binding of its iOS counterpart rather than the plainer version in OS X. In addition to the two new apps, iCloud Mail and Calendar are both getting minor updates. 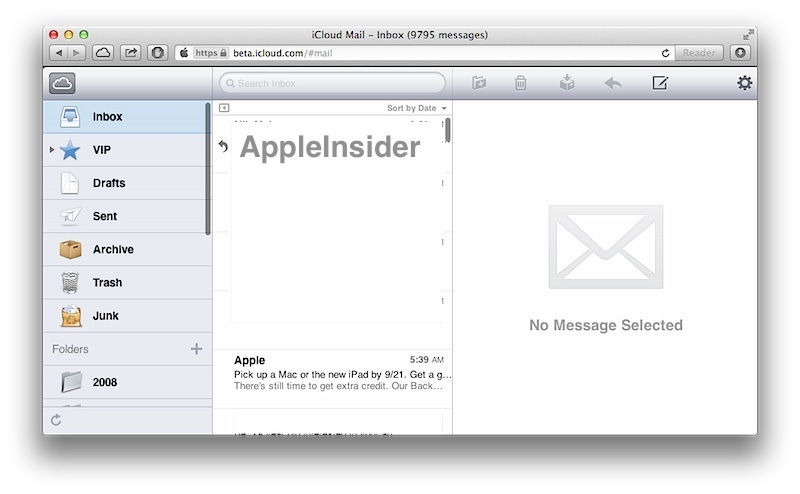 The new Mail (below) adds support for VIP inboxes introduced in Mountain Lion's Mail this summer. Mail also uses iOS style scroll bars that are skinnier and translucent, in strange contrast to iCloud's Calendar app, which continues to use a standard scroll bars with a full gutter and arrow buttons (below, in contrast to the modern scroll bars in Safari next to them). The only apparent change in Calendars is the removal of the Reminders list, which is now its own app. Similarly, the iCloud Contacts app hasn't changed at all, so it retains the odd "bookmark" control for accessing contact groups that Apple has removed from both the OS X and iOS 6 versions of the app. 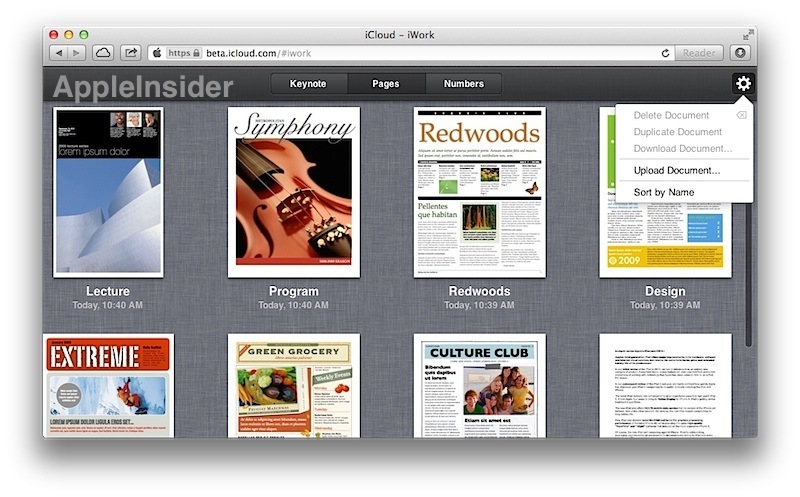 Also left apparently unchanged is Apple's support for saving and accessing iWork documents from the web (below). Overall, the company's web strategy for iCloud seems very conservative, given that both Google and now Microsoft have made web versions of their office apps a prominent part of their software strategy. Expectations that Apple would also rush to bring document editing to the web have been completely wrong. Instead, the company has focused on native apps for both OS X and iOS, although it hasn't released a significantly new version of iWork for OS X since the '09 versions launched nearly three years ago. 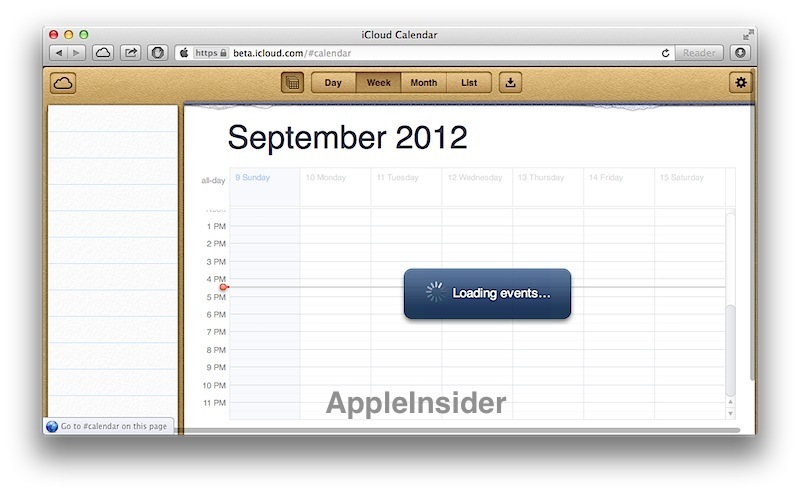 It has, however, added a variety of important features, with pioneering iCloud document support among the most obvious.